Write it, sing it, play it. : Phil's Jam for FSHD in 1 day!!! Phil's Jam for FSHD in 1 day!!! Phil's Jam for FSHD was an idea I have had in my head for a long time. Why not gather some amazing talent, put on a great show and raise money for FSHD research all at the same time? With the help of Wild Wing Café and my family. I was finally able to make it happen back in February. 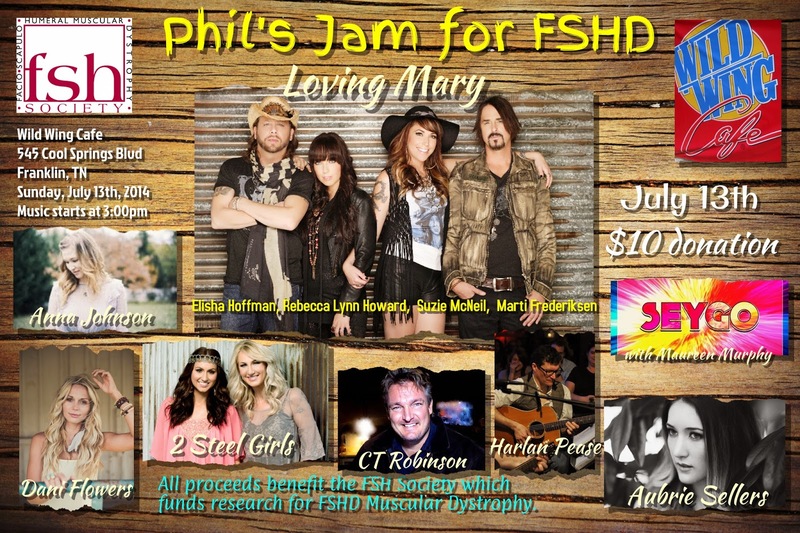 The 2nd Phil's Jam for FSHD is in 1 day and I couldn't be more excited. Singer/Songwriter Harlan Pease. Boston native that really knows how to write a song and play a guitar. Heck of a nice guy too! Singer/Songwriter CT Robinson. He's a little bit rockabilly, a little bit country and a whole lot talented. He's also my Cousin. Singer/Songwriter Dani Flowers. Her lyrics will move you. She's a blend of Dolly, Patty Lovelace with some Lee Ann Womack thrown in. Singer/Songwriter Aubrie Sellers. She has a retro country blues vibe that is really great. So much fun to watch, which is the mark of a true entertainer. And she is also a great songwriter. Singer/Songwriter Anna Johnson. I'm in awe of this girl's songwriting, arrangements and singing. She has such emotion and passion wrapped up in her lyrics. Plus my Grandson Gavin loves her CD. That's a huge vote. Singer Maureen Murphy and Seygo. This group's high-energy, Rhythm and Blues sound will win you over right away. I've seen them live and was totally impressed. This is a really talented group of people. Vocal Duo 2 Steel Girls did very well on Team Blake of the NBC TV show The Voice. Since then they have been playing shows all over the country. I am so honored to have them join the cause. They really know what they are doing. Last but certainly not least, vocal group Loving Mary. When you lock four accomplished songwriters in a room, magic tends to happen. Born one night out of that magic was the band Loving Mary. Rebecca Lynn Howard, Suzie McNeil, Elisha Hoffman and Marti Frederiksen fuse their talents and experiences together into four-piece harmonies that dip from Americana to Country with a spin of Alternative. I would say that I am thrilled to have such a line up. Don't miss this show!! See you Sunday at Wild Wing Café in Franklin, TN. The music starts at 2:20pm and goes all day. Here's a link to the event page. Follow me on Twitter at @philbennett or @philsjamforfshd.